Canada Day is a statutory holiday in Canada and is always celebrated on July 1st. If you're looking for something to do to celebrate Canada's birthday, here are a few of the annual Canada Day events which usually take place every year in Toronto (some are subject to change and/or are weather permitting). This year Canada Day is an even bigger deal since it will be the nation's 150th birthday, so expect even more exciting celebrations across the city and beyond. Fireworks are a huge part of Canada Day and luckily, there are several options for getting your fireworks fix each year over Canada Day weekend. There will be four locations of free, Canada Day fun to celebrate Canada Days! a city-wide celebration in honour of Canada's 150th birthday. The festivities are being held at Nathan Philips Square, Mel Lastman Square, Humber Bay Park West and Scarborough Civic Centre and of course, will include fireworks. You can also opt to take the family to Downsview Park for a free fireworks display on July 1st. Spend Canada Day by the water in Toronto's east end. Each year you can expect a fun fireworks display that usually starts around 10 p.m. Go earlier in the day with a picnic to enjoy the beach and then stake out your spot for the big show. The Rotary Club of Etobicoke hosts a huge three-day festival in Centennial Park where you can enjoy live music, rides, carnival games and of course a wide selection of ribs and other food. Ribfest runs for an extended version of the long weekend with fireworks on Canada Day itself. Weather permitting, the giant theme park just north of Toronto puts on a fireworks display on July 1st at approximately 10 p.m. If you're in Scarborough for Canada Day you can celebrate at Thomson Memorial Park with a full day of family-friendly activities that usually takes place from 10 a.m. until 4 p.m. There should be kids' activities, live entertainment, various vendors and food trucks on site. A Canada Day parade takes place at 4 p.m. with fireworks at 10 p.m. at nearby Milliken Park. If you feel like getting outside of the city, approximately 40 minutes northwest of Toronto, the Albion Hills Conservation Area offers family-friendly entertainment on July 1st beginning at 4 p.m. with free admission and free parking. Enjoy a magic show, hay rides, live entertainment, food trucks and more, with fireworks at dusk. Harbourfront Center offers one of the most jam-packed Canada Day celebrations in the city each year. Head down to the waterfront for a free celebration featuring food, a marketplace, plenty of live music and of course, a fireworks display to cap off the party. If you feel like doing something extra special for Canada Day or just want to do something a bit different, why not spend Canada Day on the water? Several companies offer special cruises of the Toronto harbour over the Canada Day weekend, including lunch and dinner cruises, and fireworks cruises coinciding with Harbourfront Centre's fireworks. 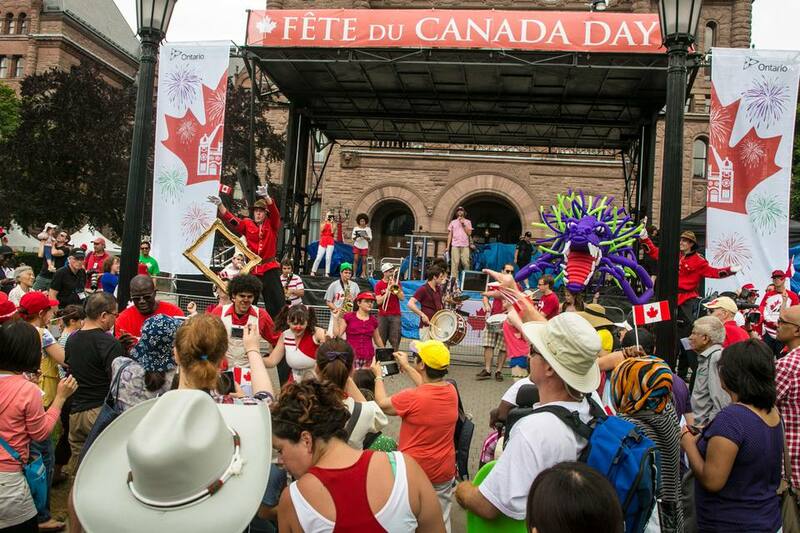 The south lawn of Queen's Park has free family entertainment, inflatable attractions, food vendors, live performances, carnival games, workshops, face painting and more for Canada Day. Visit Black Creek Pioneer Village on July 1st to celebrate Canada's birthday like it's 1867, with traditional games, horse drawn wagon rides, music and much more. Toronto's Historic Museums also make for a memorable way to celebrate Canada Day. Enjoy family activities and special events at Colborne Lodge, Fort York, Mackenzie House, Scarborough Museum, Spadina Museum or Todmorden Mills.